Yeah, yeah Roberto Cavalli Exotica is a little gaudy but do you know what I like it. It's loud, proud and strutting its stuff like a peacock. Will it sit comfortably amongst my Chanel parfume collection? Probably not but the shocking pink and gold bottle is not one you will forget in a hurry and lets face it in such a vast market being instantly recognizable is nothing but a bonus. How would I describe Roberto Cavalli Exotica? In a word unforgettable. It is somewhat a romantic scent yet a little brash - it is one of those fragrances that demands attention and wouldn't be out of place on a wild night out but don't let that put you off. Roberto Cavalli Exotica manges to grip everyone's attention yet is warm and utterly feminine thanks to the pretty floral notes such as frangipani. Being a Summer launch there is of course a few fruity notes in the mix too - most notably Mango which is bright but not overly citrus based. Will Roberto Cavalli Exotica be for everyone? No but I can imagine that those who do fall in love with the rich blend will fall hard! 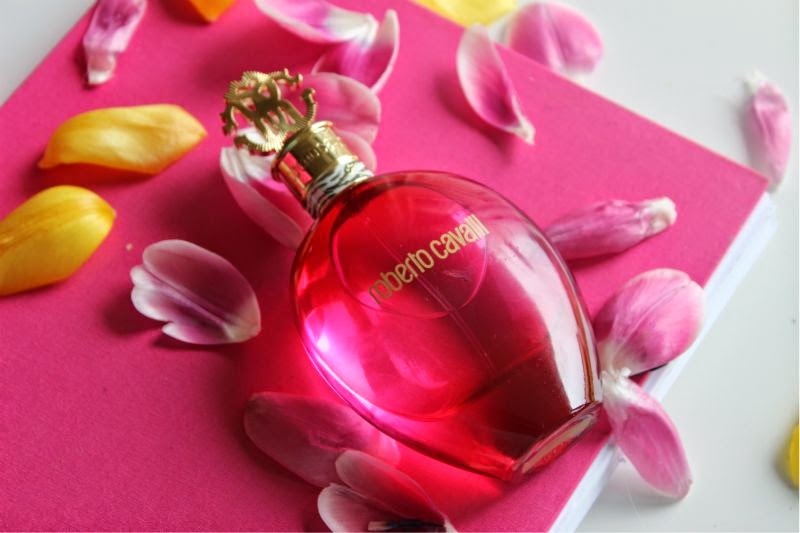 Roberto Cavalli Exotica EDT £58 via House of Fraser - link. beautiful bottle. I do like a good perfume!